Lawn Aeration - Dowco Enterprises, Inc.
Aeration equipment removes 1.5 – 3 inch plugs of soil to allow moisture, air & nutrients down to the root zone. 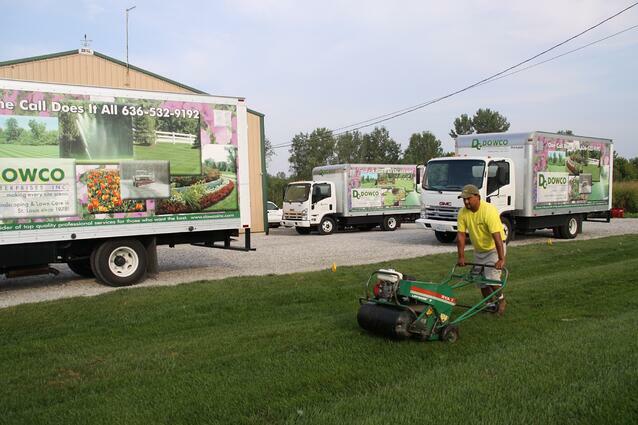 A double aeration includes two passes in opposite directions to multiply the opportunity for a successful lawn. Why is lawn aeration necessary? Reduces soil compaction – Just as you wouldn’t try to plant a flower in concrete… a rock hard, compacted soil bed is not conducive to a great lawn either! Whether or not you are over-seeding this year, loose soil allows grass roots to plunge deeper into the soil to find vital water resources in times of stress. Reduces thatch – Thatch is made up of grass stems and roots that accumulate faster than they breakdown. Excessive thatch creates an environment that is favorable to pests and disease. Allows access to the root zone – By penetrating the soil, you’re allowing moisture, air, food (fertilizer) down to the root zone where nutrients are absorbed. Enhances seed germination – Grass seeds germinate easily in aerator holes as the holes provide them a place to hide. Grass seed must be in direct contact with topsoil to germinate and will not germinate in thatch. Power raking and slice seeding are not appropriate for mature lawns. These destructive practices tear the roots of the established grass plants causing extensive damage and forces a restart of your lawn instead of a gentle fall rejuvenation. The Dowco Difference: Dowco will upgrade your single aeration to a double aeration at no additional charge with the purchase of seed & starter mulch.